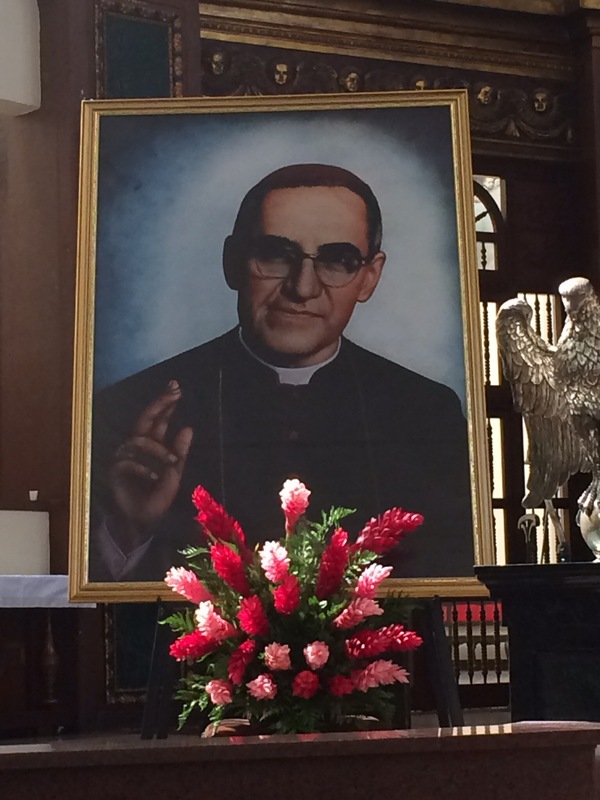 When Oscar Romero was a priest, he was walking down the street in his collar, several women approached him begging him to visit their sons locked up in jail. 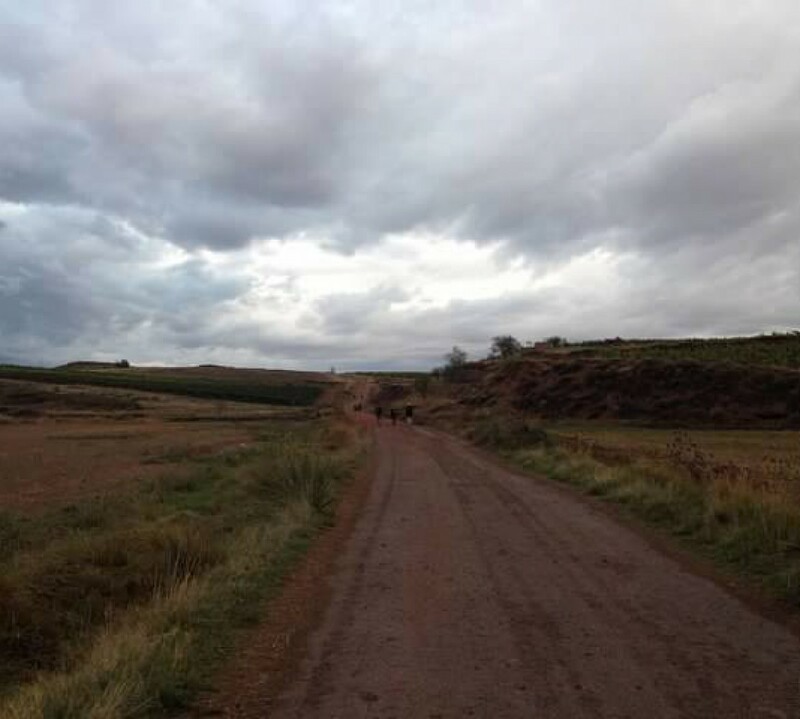 One of the young men had diabetes and needed his medication or he would die. Romero didn’t truly understand why they were imorisoned but he agreed and “snuck” the medication inside and was able to give it to a pleading mother’s son. 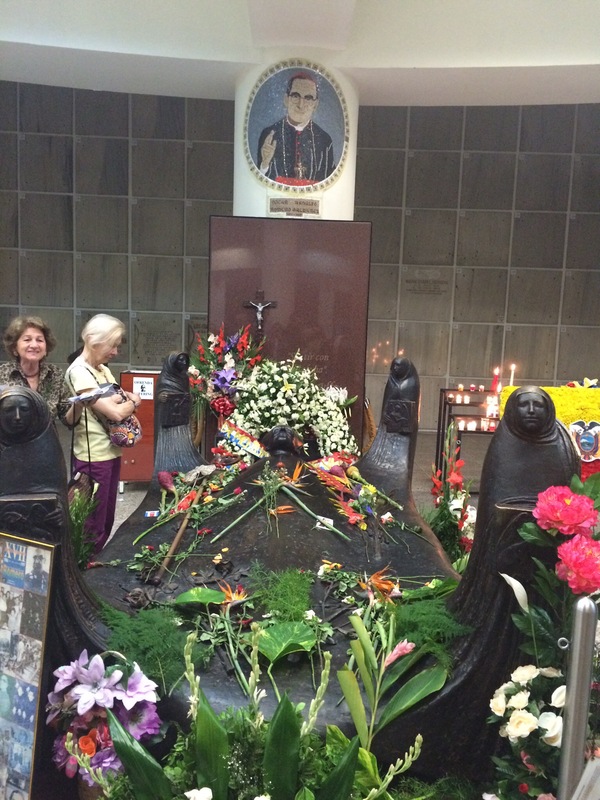 After the incident, he continued to meet with these impassioned mothers…women…who became one of the instruments God used to pry open Romero’s heart to the truth. His prophetic voice began to be gently articulated as he “saw” the realities of injustice. Romero emerged from his protective shell as he allowed the Light to shine in dark places, including in his own heart. What was this darkness? Ignorance and indifference to those who have no voice or power. It’s much easier to say, “There’s nothing I can do,” or worse, “I CAN’T make a difference.” In listening to these “comadres” Romero found his own voice for the voiceless. in glass and on display near the main altar in the cathedral. One can see the blood and a small, neat HOLE in the upper left side, near the heart. The assassin knew what he was doing and he did it with precision. Today was a beautiful , powerful and sobering day. Being there, near the tomb, right before my eyes, is an experience that can’t be had reading a book. Nor can hearts be changed simply by reading and watching the news. Seeing, talking with and sharing stories with people who live with such uncertainty and injustice is something most of us can do in our own way. But we have to be willing to walk away from such encounters different…troubled…wondering how one should respond. When you see poverty and injustice on such a large scale, it takes one’s breath away. On this Feast of the Holy Spirit, when our breath is taken away, Christ breathes His Spirit in us. 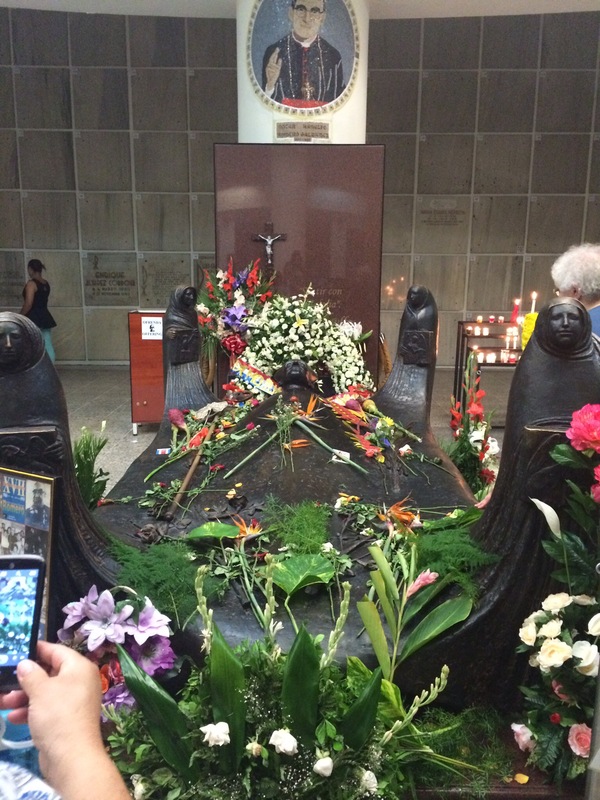 This Spirit frees us from discouragement and apathy, as it did Romero. The spirit frees us to respond in our own little ways to righting the wrongs in the world. Who will even notice or care? God is the only one Who need see us responding. For Romero, it all began with a “chance” encounter with desperate mothers wanting him to do something. One short, little visit to a young man in prison set Romero on his path. One small step at a time will eventually change the world. What a wonderful man and great example for us to follow! Praying for safe travels and wonderful, if sobering, experiences along the way. P.S. The church looks amazing!! And A Good Monday Afternoon to You!!!! 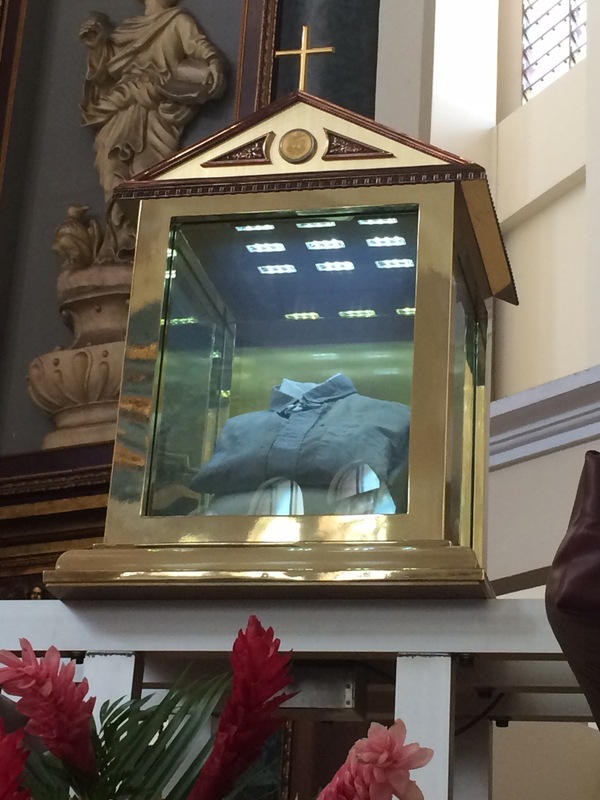 I loved today’s blog and the impact of the encased shirt was very moving. I hope you are only drinking bottled water.